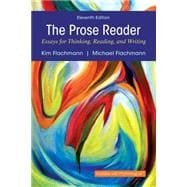 Lucid writing follows lucid thinking – and The Prose Reader, Eleventh Edition helps students think more clearly and logically in their minds and on paper. Organized by rhetorical pattern, this reader builds upon critical thinking as the foundation for close reading and effective writing. Numerous discussion questions and writing assignments for each selection lead students from literal-level responses to interpretation and analysis. These questions, and the essays they frame, immerse students in some of the best examples of professional prose available today. This title is also available with MyWritingLab, an online homework, tutorial, and assessment program designed to work with this text to engage students and improve results. Within its structured environment, students practice what they learn, test their understanding, and pursue a personalized study plan that helps them better absorb course material and understand difficult concepts. In addition to the full eText, activities directly from the text are available within MyWritingLab. These include written assignments, readings from the text, review exercises, and more. Kim has dedicated her career to helping students achieve their goals in life through communication. Her mission has always been to teach others how to write well, which she believes is one of the most important gifts we can give our students. She believes that reading and writing are the gateways to each student’s full potential and success in life. The description of a simple, comforting ritual—the putting up of a front-porch swing in early summer—confirms the value of ceremony in the life of a small town. Have you ever wondered what being in prison is like? Kimberly Wozencraft takes us for a no-nonsense tour of the “correctional institution” in Kentucky that was her home for more than a year. Do you enjoy watching people? Prairie Home Companion creator Garrison Keillor draws some hilarious conclusions about pedestrians on a busy New York City street as they jump over a small stream of water. In this humorous, touching, and ultimately optimistic essay, the author introduces us to the unfamiliar “country” of old age. Do you think we will walk on Mars during your lifetime? This description of the planet will prepare you for the next phase in our exploration of space. A Native American author responds to prejudice with a search for ethnic and cultural pride. Deserted by her husband, a proud and determined Annie Johnson decides to “step off the road and cut . . . a new path” for herself. This fascinating essay describes how Brenda Combs, a homeless crack addict, rose out of the gutter to become an award-winning schoolteacher in Phoenix. The only daughter in a large family, Sandra Cisneros feels overwhelming pride when her father praises her skill as a writer. In this autobiographical essay, Pulitzer Prize–winning author Russell Baker offers a nostalgic look at his childhood days in the small town of Morrisonville, Virginia. How can we measure the value of education? Christopher Nelson has some answers that do not involve economics. Do you speak the same language in public that you do in private with your family and friends? Richard Rodriguez argues for the importance of both forms of communication. How should we treat the handicapped? Blind author Harold Krents gives us a few lessons in judging people on their abilities rather than their disabilities. Can social media help detect mental illness? And if it can, how should we respond? Jacobson offers some thoughts on both of these issues. Brent Staples’s horrifying description of his brother’s inner-city killing lays bare the decay of urban America and its effect on the young African-American men who are imprisoned there. In this chilling and macabre essay, celebrated “muckraker” Jessica Mitford exposes the greed and hypocrisy of the American mortuary business. Change is always difficult. But Kanchier offers several ways to handle change sensibly, based on interviews with others who have made positive changes in their lives. Making new friends as an adult is not like our childhood relationships. But Vozza has some effective suggestions for navigating this new terrain. According to this author, good communication follows one important rule: The type of communication must fit the situation. People can be smart in different ways, which Gilbert explains in this essay with examples to support her classification system. Are you an only child? A middle child? Or the youngest in your family? According to the author, our birth order can have a powerful effect on the way we live our lives. In this provocative and intriguing article, author Amy Tan examines the relationship between her mother’s “fractured” English and her own talent as a writer. Ever stretched the truth? Stephanie Ericsson catalogs the ten worst kinds of falsehoods, from “white lies” to “delusion.” Which is your favorite? Why do so many Asian students excel in school? According to Amy Chua, it’s because their mothers are much more demanding than their Western counterparts. What drives certain individuals to be leaders? This study of two historical figures helps us identify the characteristics of those who naturally take charge. MOTOKO RICH Literacy Debate: Online, R U Really Reading? Is surfing the Net ruining our minds? New York Times reporter Motoko Rich presents a balanced and intriguing analysis of the dangers and rewards of spending too much time online. Feminist Gloria Steinem examines the extent to which strength means sexual power. Can music really characterize a generation? Tierney says it can and set out to prove it in this essay. WAYNE NORMAN When Is a Sport Not a Sport? What makes an activity a sport? What about an Olympic sport? Norman has strong opinions to share on this topic. Robert Ramirez lovingly describes the “feeling of family” in a typical inner-city barrio. Everyone agrees that all bullying must be stopped, but very few have any concrete suggestions for doing so. However, Svoboda offers some guidelines we need to consider for addressing virtual assault. What is a “family”? Psychologist Mary Pipher attempts to answer this intriguing question by examining the effect that different categories of family members have on our ability to function in the world around us. Binge drinking is a dangerous type of drinking that Hanson claims is on the decline among current college students. Do you think society deals with drinking and youth responsibly? Seen any good horror movies lately? Best-selling author Stephen King explains why we are so fascinated by films that appeal to our darker instincts. An angry and frustrated Michael Dorris describes the long-term damage done to his adopted son, Adam, by the ravages of fetal alcohol syndrome. Why should we read literature? “Let me count the ways,” says former National Endowment for the Arts chair Dana Gioia, as he details the intellectual and spiritual nourishment conferred on us by imaginative works of art. ART MARKMAN Can Video Games Make You Smart (Or At Least More Flexible)? Can video games increase your ability to learn? Markman has some evidence that demonstrates some of the positive results of these games. Are you so worried about your health that it’s making you sick? Sociologist Frank Furedi explains why the concept of “illness” is increasingly important in our modern world. How do you think the Internet is affecting your brain? Carr provides some startling evidence in this essay to prove that the Internet is dramatically changing the ways we think. Retired Col. Dave Grossman questions the role models we are creating for our kids through violence on TV. In this essay, he challenges us to regain control of child abuse, racism, and poverty in American society. Are you aware of how people refer to mental health issues in their everyday lives? Are they always respectful of different mental illnesses in their references? Through this essay, Pugsley helps us build a sensitivity to these issues. SUSAN TARDANICO Is Social Media Sabotaging Real Communication? When is social media constructive? When is it destructive? Being aware of its advantages and disadvantages is part of improving our ability to communicate in society. Peter Roff debate the issue from three different sides. In this speech, Watson suggests that we all share the responsibility of gender equity. Doing so will benefit us all. U.S. Poet Laureate Billy Collins praises the art of scribbled comments in the margins of books, which often reveal volumes about the people who write them. William Stafford describes through brilliant and evocative metaphors the very moment he realized he had to be a poet. During a hot summer in Oakland, surrounded by drug dealers and social misfits, author Jessica Anya Blau investigates the mysterious relationship between art and life. Where does this gate lead? Let your imagination be your guide.